I know the store now... They are in Mirvish Village here in the city (which by the way if you have a few 100 million you can buy as it is up for sale). Never been there, but I understand they have a decent stamp section and carry a fair bit of supplies as well. Keep meaning to visit as it is pretty close to the lower section of my street. Why don`t you drop by on Friday after 11:00 a.m. and we can say hello in person? He`s open till 6:00 and I`ll probably be there for a good part of that time, except for a brief trip out to the nearest cheap restaurant for lunch. Doubt that I will tinker with things today. It's too nice outside, and I'm not brave enough to attempt to do anything with little pieces of paper in a breeze. I like to use Facebook because my other friends can see my pictures.No I don't get stamy ads from anyone. In the old SB I had a hard time posting pictures so I just told members to hit the F button to get my facebook page. If You want to see my facebook pages I can send you my name. ever took - I still have some things to learn there too! But most of them are okay. The album with every stamp in a mount will be first on my list. Well I have a few days off work, and I have been neglecting getting my collection in order, so may do that over this weekend. Well, I officially ran out of mounts last night. Updating the last of the Aussie pages that I got more stuff into. Might spend today scanning the collection and updating it on here. Either that or spend some time going through the boxes of duplicates that we have here and organise them. I decided to start sorting GB so that I could do a swap with a fellow bear. I think I am biting off more than I can chew. At least 75% of my GB stamps are Machins. So I guess you can conclude what my next collection is going to be. Yep. Machins. Now to get the pages. Found a wonderful website to help me identify them all. www.adminware.ca/machin.htm. And I am going to try to scan Vol 2 of Australia today and get them posted. Am I being stampy on this hot TX day? You betcha!!! Get better soon Perfs! I just got over something myself! No fun at all. as for stampy.. not a darned thing.. just have not made the time - plenty to o just no desire the last couple weeks. going to try soon just want a lazy day and early bed tonight. Today, I have been trying to print labels for our local stamp club's letter to the membership. Boy when you don't do something regularly like printing labels, you have to relearn the process all over again. Finally printed the membership labels and return labels. 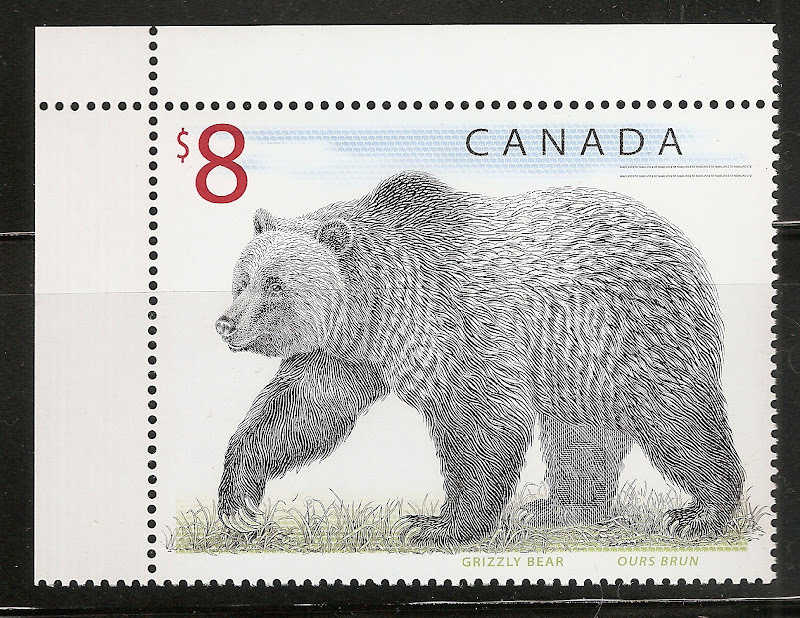 Now it is time to upload some more stamp images onto Stamp Bears. I just typed a list of 30 of the postcards I bought from Ted Wright in Toronto the other day and am not finished them yet. Worked on Australia for the last 2 days. I am enjoying learning as i hinge the stamps into my album. I am scanning Vol. 4-5 of Australia to post on here and then I am going to finish sorting GB for a swap. For the past few days I have been putting my extra Iceland stamps in 7-row black stock pages by Scott numbers.This is only the second time I have done this,my first time was with my US stamps. In the past I would put my extras in glassines and write the scott number on the right corner of the glassine.But I have a hundred of these 7-row black stock pages,so I thought Iceland would be a nice country to do this to. I have to thank winkerbids for sending me his Iceland wantlist.I was looking for stamps in a glassine of Iceland to fill his wantlist and it was taking a long time. So I thought to myself there must be a faster way. Now that my camera is back home I will take a picture or 2 when I am done.